Can Caterpillar's Stock Continue to Soar? 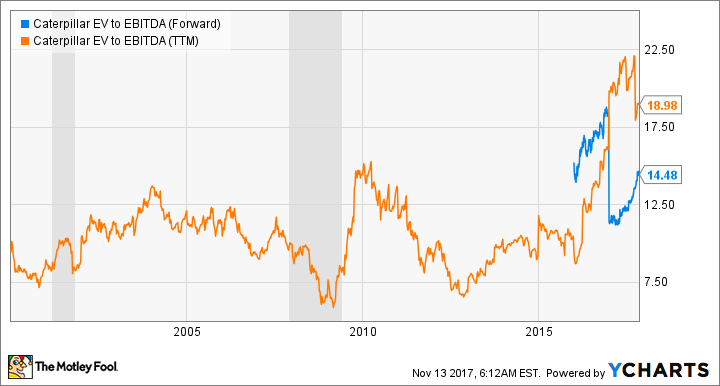 The nearly 48% increase in Caterpillar Inc.'s (NYSE:CAT) stock price over the past year has taken the stock up to heady-looking valuations that can only be justified if the company keeps raising earnings guidance. That kind of statement usually leads to concluding that the stock's priced to perfection and significant downside risk exists. That may well be a valid conclusion, but Caterpillar did raise guidance again on its third-quarter earnings report, and its end markets continue to strengthen. Can the stock's run continue? Before getting into the details, let's look at the stock's valuation in terms of enterprise value (market cap plus net debt) to earnings before interest, tax, depreciation, and amortization -- a commonly used valuation metric. Caterpillar stock trades at a current EV/EBITDA ratio of around 19, a historically high rating. And even when you look at a forward rating of 14.5, it's still high. But here's the thing. The company continues to raise guidance, and thanks to its substantial operational leverage, meaning it can leverage sales growth into sharply increased profits and vice versa, improvements in its end markets are resulting in improved sales expectations and dramatically improved profitability -- a theme of Caterpillar's earnings in 2017. $38 billion is a "reasonable midpoint expectation"
Data source: Caterpillar Inc. presentations. Revenue is in billions of U.S. dollars. It's partly a combination of improving end markets and management's conservatism with guidance. Moreover, the recent third-quarter results saw broad-based improvement in Caterpillar's end markets, which are backed up by looking at the outlook from peer Deere & Company (NYSE:DE). Although Deere's main focus is on agricultural machinery, its smaller construction and forestry segment has raised sales expectations as the year has progressed. For example, Deere's last forecast was for its financial 2017 net construction and forestry sales to increase 15%, up from a forecast of just 1% given at the start of its financial year. Similarly, Caterpillar increased its full-year sales outlook in every equipment segment. The heavy lifting in the third quarter, in profit terms, came from the construction and resource industries segments. Data source: Caterpillar Inc. presentations. Profit in millions of U.S. dollars. Equipment segment profit share before corporate items and eliminations. On the bullish side of the argument, Caterpillar said "the mining cycle has started to turn," which is good news for the resources segment, and the recent uptick in the price of oil is likewise good news for Caterpillar's energy and transportation segment. In addition, the construction industries segment has significant oil and gas exposure. Quoting from CFO Brad Halverson on the third-quarter earnings call, "North America end-user demand increased primarily due to increasing activity in the oil and gas industry, including an uptick in pipeline construction, and improving residential and nonresidential construction." Also, according to Halverson, "China continues to be a bright spot and a surprise to the upside" with regard to the construction segment. Indeed, Caterpillar's earnings show how important growth in China is Caterpillar. In addition, price realization in the third quarter -- $343 million of the overall $1.1 billion in operating profit improvement -- along with an improving profit environment, and Halverson's commentary that " dealer inventory in terms of months of sales are low based on historical levels and are lower than at the end of the second quarter," all suggest that Caterpillar sales could enjoy a boost in the near future. On the other hand, there's no guarantee that oil and resources prices will continue to move higher, and most forecasters are predicting that China's real GDP growth will slow from the 6.8%-6.9% range generated in the first three quarters of 2017.Indeed, there are already signs of cooling in the fourth-quarter, with the National Bureau of Statistics data showing that the yearly growth rate in fixed asset investment in the Jan-Oct period was 7.3% compared to the yearly growth rate of 7.5% in the Jan-Sep period. Moreover, management believes that construction machinery demand was pulled forward in China before construction activity slows in the winter. If this turns out to be an un-seasonally strong pull-forward, then Caterpillar's China sales growth might correct in the coming quarters. Meanwhile, rising resource prices, which is good overall for Caterpillar, also create some headwinds. For example, Halverson expects "higher steel costs to put pressure on material costs moving forward," something likely to pressure margin in the future. What to do with the stock? Given the importance of rising earnings estimates, I believe that those looking for exposure to oil and mining commodities, as well as China, are the only ones buying the stock. If you're confident in these end market drivers, then go ahead and buy the stock and wait for earnings upgrades. However, unless you're specifically looking for these exposures, then Caterpillar's run has left the stock's valuation looking expensive on a risk/reward basis.